To ask other readers questions about Why We Sleep, please sign up. Can this book tell me how to GET to sleep and STAY asleep for the "required" 7-8 hours? Simon Harvey No, it's not really a how-to guide. There is a two-page appendix which gives tips for getting consistently good sleep, based on the information from…moreNo, it's not really a how-to guide. There is a two-page appendix which gives tips for getting consistently good sleep, based on the information from the National Sleep Foundation. That said, it's easy to draw conclusions from the way that light and heat have an impact. Does he explain why we fall asleep on the sofa watching TV, but then we go to bed we can't fall asleep? This book is genuinely terrifying. The author, a sleep scientist, lists the devastating consequences of getting less than 7-9 hours regularly and it is so much worse than you might have thought. SO much worse. We're basically all going to die. I'm not even kidding--being just an hour short on sleep a day will do serious damage to your immune system almost immediately, and the Western world is in the grip of a massive sleep deprivation epidemic. Lack of sleep is a carcinogen, literally. It also d This book is genuinely terrifying. The author, a sleep scientist, lists the devastating consequences of getting less than 7-9 hours regularly and it is so much worse than you might have thought. SO much worse. We're basically all going to die. I'm not even kidding--being just an hour short on sleep a day will do serious damage to your immune system almost immediately, and the Western world is in the grip of a massive sleep deprivation epidemic. Lack of sleep is a carcinogen, literally. It also destroys your ability to control your emotions and understand those of others, your memory, your creativity; it predisposes you to eat more *and* to put on more weight; oh, and it is closely linked to ADHD for the young and Alzheimers for the old. Basically, if you go on Twitter and think "why is everyone and everything so absolutely awful" it's probably related to society-wide chronic sleep deprivation that people don't even realise they have. This book is genuinely horrifying (ironically, it will keep you up all night fretting). Some of the more striking findings are the absolute madness of night shifts and junior doctor rotas, the self destructive cruelty of school starts that require kids to be awake at 6, and the hecatombs of deaths caused by tired drivers. We've once again managed to set up a social structure apparently designed to cause as much mental and emotional harm as possible to humans. Well done us. For once, I actually mean five stars in the sense of "everybody should read this book." This book is highly readable but contains stunning information I'd never seen anywhere else (and includes numerous references to serious primary literature). I was reminded (stay with me here) of ancient Egyptian funerary practices. After carefully embalming organs like the heart and liver, and placing them in canopic jars, the Egyptians pulled the brain out with a hook and threw it away, because they didn't r For once, I actually mean five stars in the sense of "everybody should read this book." This book is highly readable but contains stunning information I'd never seen anywhere else (and includes numerous references to serious primary literature). I was reminded (stay with me here) of ancient Egyptian funerary practices. After carefully embalming organs like the heart and liver, and placing them in canopic jars, the Egyptians pulled the brain out with a hook and threw it away, because they didn't really know what it was for. This is how most modern people approach sleep. We know it must be sort of important, because why else would it be there, but we're quite foggy on the specifics and tend to give it short shrift. At worst, we see it as an "annoying and enfeebling" obstacle to other uses of our time. Some standout topics here: your natural day/night pattern and the buildup of a chemical called adenosine in your brain that makes you sleepy, which contribute independently to your sleep cycle; and how caffeine and jetlag get you off your rhythm. (This was particularly interesting to me because I read this on a long flight. I never sleep on flights to Europe and this book explains why: I'm not sleep deprived enough to have excess adenosine to make me sleepy, plus it doesn't feel like nighttime yet when we depart. So my brain isn't interested in sleeping. When I arrive, my goal is to stay awake until 9pm and at first, it's easy. That's the "day" part of the circadian rhythm giving me a bit of a boost. But soon, that fades away and the extra adenosine comes crashing down.) The role of sleep in processing memories and new information: sorting out what's important, solidifying newly gained understanding, and turning traumatic experiences into bearable memories. How all creatures sleep, but in different ways that make the brain-repairing effects of sleep compatible with their environments. Some things that we think aid sleep, like alcohol and sleeping pills, are only useful if your goal is to lie inert in bed; they don't lead to true, restorative sleep. Oh, and the doctor who developed the system for medical residents, and insisted that long shifts and little sleep were essential training, was a big-time cocaine addict. There's some genuinely frightening information here as well. Sleep deficits cannot be made up (sleeping in on the weekends doesn't help) and lead to shorter lifespans. Lack of sleep contributes to Alzheimer's disease, mental illness, and cancer. (The WHO categorizes night shift work as a probable carcinogen.) Drowsy driving is more common than drunk driving and more dangerous. We may be seriously harming the country's teens by forcing them to wake up and go to high school at an hour so inimical to the circadian rhythm of that age group. I already follow the author's advice about "sleep hygiene" so I was mostly attuned to the scientific information and arguments here about social ills. Many people in my sleep-deprived cohort may be genuinely alarmed to read this book. But that doesn't mean you shouldn't! I read so many nonfiction books with titles like this one that are ho-hum--but this one's a humdinger. Have you ever felt knackered that you needed to catch some z's hopefully to sleep back what you've previously lost? Have you not slept a wink even if you hit the hay awhile ago and just decided to take some sleeping and other sedating drugs just to make you sleep like a log, but then you would wake up feeling like a zombie of sorts? Well, have no fear, the doctor's here! Not me, okay? Mind you! "Ultimately, asking 'Why do we sleep?' was the wrong question. It implied there was a single function, one holy grail of a reason that we slept, and we went in search of it." "Sleep enriches a diversity of functions, including our ability to learn, memorize, and make logical decisions and choices. Benevolently servicing our psychological health, sleep recalibrates our emotional brain circuits, allowing us to navigate next-day social and psychological challenges with cool-headed composure." Dandy eh? For the average adult, 16 hours of wakefulness and 8 hours of sleep is the optimum balance. Caffeine and alcohol are also considered as two of the most common culprits from getting your much-needed slumber, not without evidence. Regarding insufficient sleep or not getting the same quality/quantity of it, you might want to hide under the sheets now as the next one will be a terrible and panic-inducing rollercoaster ride! Well, hang on to your pants and knickers, ladies and gents! Sleep loss inflicts such devastating effects on the brain, linking it to numerous neurological and psychiatric conditions (e.g., Alzheimer’s disease, anxiety, depression, bipolar disorder, suicide, stroke, and chronic pain), and on every physiological system of the body, further contributing to countless disorders and disease (e.g., cancer, diabetes, heart attacks, infertility, weight gain, obesity, and immune deficiency). If that doesn't horrify you, I don't know what will! For those who are on a graveyard shift, you have been officially warned. "A number of prominent epidemiological studies have reported that nighttime shift work, and the disruption to circadian rhythms and sleep that it causes, up your odds of developing numerous different forms of cancer considerably." How... umm... reassuring, Dr. Walker! Nevertheless, thank you for that fact. Furthermore, have you ever heard about Fatal Familial Insomnia (FFI)? Good grief! I would never ever touch that one within a ten-foot bargepole, but just so, you all must know that "a lack of sleep will kill a human being." There are also a lot of scientific terms here that might be familiar to you such as REM or NREM sleep, suprachiasmatic nucleus, circadian rhythm, melatonin, etc. None of which I will discuss in full detail lest my puny brain would unnaturally go supernova! Dreams are discussed here too, but I won't be delving on it. By the way, if you also want to magnetise someone with your looks, sense of humour, and personality, along with increasing your chances of landing your first sloppy snog or ultimately going for a home run (a titillating yee-haw! ), well mates, heed the sleep scientist's advice: have some shut-eye! "Reproductive hormones, reproductive organs, and the very nature of physical attractiveness that has a say in reproductive opportunities: all are degraded by short sleeping. One can only imagine Narcissus being a solid eight-to nine-hour sleeper on the basis of the latter association, perhaps with an afternoon nap for good measure, taken beside the reflection pool." And there you go, dear folks! Sleep you must and sleep you will! Because I command thee! So, fare thee well! For now, I send thee up to the wooden hill to Bedfordshire! Get it? Good! The less you sleep the shorter your life span will be. Do I have your attention yet? If so read this excerpt from the beginning of this book (p3-5), and you will understand why this book caught my attention. This book is divided into four parts. Part 1 defines the nature and types of sleep, describes how the need for sleep changes over a life span, and goes on to discuss the evolutionary origins of sleep. Part 2 describes why you should sleep and lays out the dire consequences of not sleeping. The less you sleep the shorter your life span will be. Do I have your attention yet? If so read this excerpt from the beginning of this book (p3-5), and you will understand why this book caught my attention. This book is divided into four parts. Part 1 defines the nature and types of sleep, describes how the need for sleep changes over a life span, and goes on to discuss the evolutionary origins of sleep. Part 2 describes why you should sleep and lays out the dire consequences of not sleeping. Part 3 explains how and why we dream, and Part 4 takes on the broader societal issues in dealing with sleep needs. An Appendix is included for "Twelve Tips for Healthy Sleep." The primary message of this book is to emphasize the importance of adequate sleep. There are some suggestions included for obtaining adequate sleep, but the primary message is why it's important for health. An indication of how important is that lab mice that are deprived of sleep die sooner than those deprived of food. The book ties the lack of sleep to numerous illnesses, and then proceeds to make the case that lack of sleep is either the cause or part of a negative feedback loop making the illness worse. By describing physiological and neurological interactions the author is able to show how lack of sleep is involved in these processes. Then population and diseases statistics are referenced to verify the involvement sleep or lack of sleep. For many readers of this book the author will come across as an alarmist because he takes issue with so many things that we assume to be part of normal life. He makes a case that the early hours for beginning school makes no sense for optimum student performance. He sites one study that showed the average IQ of students in a school district was increased by starting school later. The author also makes a case for ending the practice of giving medical interns long work hours. Some readers will not appreciate the negative things that the author has to say about caffeine and alcohol. Incidentally, if you think alcohol helps you to sleep you need to see what this book has to say about that. Are you a night owl or morning lark? Here's a link to an excerpt (p20-25) on that subject. Here's a link to an excerpt (p68-61) about Biphasic sleep. Lack of sleep can leave you more prone to Alzheimers disease. Routinely sleeping less than six or seven hours a night demolishes your immune system, more than doubling your risk of cancer. Insufficient sleep is a key lifestyle factor determining whether or not you will develop Alzheimer's disease. Inadequate sleep—even moderate reductions for just one week—disrupts blood sugar levels so profoundly that you would be classified as pre-diabetic. Short sleeping increases the likelihood of your coronary arteries becoming blocked and brittle, setting you on a path to cardiovascular disease, stroke, and congestive heart failure […] sleep disruption further contributes to all major psychiatric conditions, including depression, anxiety, and suicidality. And this is supposed to help me sleep better!? At least before, I just used to lie there going over the same three lines from ‘I Just Can't Wait to be King’; now, if I so much as drift into momentary consciousness at two a.m., I end up paralysed with alertness, calculating the gradually rising odds that my obese, cancer-ridden body will only cease to be a concern thanks to the merciful onset of my crippling dementia. Eventually Walker just comes right out and admits that as far as the science is concerned, ‘wakefulness is low-level brain damage’, at which point you start to wonder how far he's really going to take this whole unconsciousness thing. But by then the damage is done. Your life is different. Come evening, when Hannah is pouring herself a glass of Sancerre and playing Gaga, I now appear in the doorway in my slippers, with a hot-water bottle clutched under one arm and a toothbrush jutting from my jaws. It may feel antisocial, but anything seems preferable to inviting the heart disease, obesity, cystitis, tennis elbow and plagues of locusts that Walker is otherwise promising. A while back I got a Fitbit, which allows me to see in appalling detail just how much sleep I sometimes fail to get – the hypnograms, with their discrete stages of slumber, never quite stretching as far as you'd like them to. Thanks to this book, it's now possible to quantify exactly what I'm missing out on during such nights, as scientists have mapped more of the neurochemical processes involved than I ever realised: the deep, NREM sleep where memories are carefully transferred from short-term to long-term memory; then the ‘informational alchemy’ of REM-sleep dreaming, which sharpens creativity and conjures up solutions to our daytime problems. The importance of sleep can be further appraised by its evolutionary heritage – it goes back about as far as life on earth. Walker finds that even ‘the very simplest form of unicellular organisms that survive for periods exceeding twenty-four hours, such as bacteria, have active and passive phases that correspond to the light-dark cycle of our planet’. Sleep is about the first thing natural selection locked in for us, and as far as we can tell every animal does it. One always understood that sleep was a healthy thing, but somehow a full night of it is still often viewed as a luxury. On the evidence of this book, it's more like a medical necessity. Given working practices in many parts of the world, this is a big problem, and indeed part of Walker's mission is to explain that much of the developed world is suffering from a serious, chronic sleep deficit which is ultimately ‘a slow form of self-euthanasia’ – he is talking not just to individual sleepers, but to businesses and governments who have some responsibility to take what he says into account. Jasmine I am currently reading this and I have to admit I am terrified of it. Great review, Warwick. Warwick Thanks both! And happy sleeping to all. 🌟 I am still on a quest to discover more non-fiction books, that started last year and I am willing to continue this year. So when Tala (Who also happens to be a medical student in my class) recommended this, I knew that I had to read it! 🌟 I also had the same first question that most of us will think of: How a ~370 pages book is filled with things on sleep?! This book answered many questions that I had thought about in my long sleepless nights. It explains why do we need to sleep, the evolutionary role of sleep, why do we dream and what are the benefits of dreaming, Why do we as teenagers and new adults like to go to sleep late while adults go early, why do you feel tired after you pull an all-nighter but then gradually get energized! And one of my favorite things is explaining why we like to keep one foot out of the bed at night!! 🌟 What is cooler about this is that it does so in a simple language that everyone can understand. No need to be in the medical field to do so. If you are interested in sleep then you should read this! 🌟 One of my professors once told me that people like to view the world in what they are best at. So a doctor will see everything as physiology and pathology, an engineer will see things as equations, numbers and drawings, a chemist will announce the secret of life as Alchemy. So a sleep scientist will explain everything by -you guessed it- Sleep! As much as I enjoyed the book, I thought it was trying too much sometimes! There was a graph depicting the relationship between Obesity and sleep and it shows that through the years we have been sleeping less and thus becoming more obese. Which has a certain truth to it but we can not ignore the changes in food and lifestyles too! 🌟 Also the author would tell you that if you don’t sleep well (I assure you that 99% of us don’t) then you will get Alzheimer, cancers, obesity, diabetes and all sort of things… If you find this idea uncomfortable then you may want to skip this. 🌟 Summary & Prescription: I really enjoyed this book as much as I expected to. It is kind of scientific but still awesome to read. I like that the author provided concrete evidence -Although I want to discuss some things further more- through the book and that it was not all theories. I recommend this for all of you looking for a non-fiction book and are interested in Sleep! This is such an excellent book, mainly because I had never thought very much about the need for a good night's rest. The first part of this book does not really address "why we sleep". Instead, the book describes "what happens if we do not get enough sleep." Not until about halfway through the book, does the question "why we sleep" really get answered. The author, Matthew Walker, is a professor of neuroscience and psychology. I always prefer to read science-related books that are written by scien This is such an excellent book, mainly because I had never thought very much about the need for a good night's rest. The first part of this book does not really address "why we sleep". Instead, the book describes "what happens if we do not get enough sleep." Not until about halfway through the book, does the question "why we sleep" really get answered. The author, Matthew Walker, is a professor of neuroscience and psychology. I always prefer to read science-related books that are written by scientists who are actively doing research in the field. They are the most authoritative, and they best understand all of the nuances involved in the interpretation of experimental results. As long as the science book is well written--and this book is definitely written in an engaging style--I always prefer to read a book written by an active researcher. The author divides a night's sleep into two primary portions; the early portion is characterized mostly by NREM (non-REM) sleep, while the later portion is mostly REM sleep (Rapid Eye Movements). Both portions are essential. NREM sleep helps one to cement memories into permanent storage, while REM sleep helps one to apply past experiences to solve problems. If you skimp on either portion, then your brain has a very difficult time recuperating. The book describes, in just the right amount of detail, a host of experiments that have shown the deleterious consequences of insufficient sleep. And, I was really surprised by the range of consequences, and their seriousness. This book has thoroughly convinced me to make every effort to get a full night's sleep; at least 7 hours, and preferably 8 hours. I am not going to try to recap the myriad consequences of insufficient sleep. Suffice it to say, they are truly scary. This is a fascinating book, and I highly recommend it to everyone who sleeps. So, this book is both a must read and deeply, deeply disturbing. I’ve been having trouble sleeping for the last few years and now I’m going to have to do something about it, simple as that, because the consequences of not sleeping properly are appalling. For instance, it provides you, free of charge, with an increased risk of diabetes, dementia (in all its fun and various guises), weight gain, heart disease and even accidental death. And the situation is getting worse. We are losing sleep at a r So, this book is both a must read and deeply, deeply disturbing. I’ve been having trouble sleeping for the last few years and now I’m going to have to do something about it, simple as that, because the consequences of not sleeping properly are appalling. For instance, it provides you, free of charge, with an increased risk of diabetes, dementia (in all its fun and various guises), weight gain, heart disease and even accidental death. And the situation is getting worse. We are losing sleep at a rate of knots as we squeeze the nights from both ends. Add to that the fact that our world is now awash with night-time blue light – the frequency of light we have used to tell us it is day-time ever since before we were even fish – and this particular self-created train wreck just keeps a-roll’n along. There were times in this where he would say things and I would think, ‘oh yeah, see that, you’ve gone too far this time’ – for instance, his saying that driving with a sleep deficit is worse than driving while drunk, having done both, I figured I knew better. But then he justifies this by saying that when you are drunk your reaction times are reduced, but you generally still react – but when you are sleep deprived you drop (without warning) into micro sleeps and while in them you do not react at all. You know, you are asleep. And then he reminds us of the stereotypical truck driver (by the way, in most states in the US, there are more truck drivers than any other occupation). Truck drivers are often over-weight, which is directly correlated with sleep apnoea, that is, a condition likely to increase the number of times you fall into micro-sleeps. Did I mention I found this book terrifying? The other bit of this that really struck me was the correlation between anxiety and a lack of sleep. It is almost as if we are unable to trust people as we get less and less sleep. And this also translates into an inability to lay down new memories – that is, learn things. In fact, something students often do is stay up all night studying for an exam – on the basis of ‘never do today what you can do five minutes before it is almost too late’. But such a lack of sleep is likely to leave them feeling under-confident, anxious and also seriously impaired in their ability to actually learn and remember anything they have spent the night staring blankly at. This is part of the reason why he says the shift in the US towards earlier school starting times is such a bad idea. He presents an evolutionary biology just-so story that goes: adolescents need a safe-ish way to move out of the parental nest. They do this by their body clock shifting so they stay awake later (when their parents are asleep), so they can interact with other young people in a relatively safe environment, and this means they therefore wake later than their parents too. But then we force them out of bed at 6 or earlier to cross town to go to a school that starts at 7am, and getting up at that time feels to them like getting out of bed at 4am, bad things are likely to happen. How can they possibly learn in that state? Whether or not the evolutionary story is right, it does seem teens do need to stay up later and to sleep in longer, and we ought to respect that. It also seems there is such a thing as night-owls, and our forcing them to work at the crack of dawn is just as cruel and just as stupid as our forcing teenagers to do the same thing. This kinda should be required reading for everyone. Why? Because despite the rather innocuous title and no-nonsense factual information being presented, with no less than 750 scientific studies supporting the findings within, the author OUGHT to have been screaming that we're all freaking fools and morons. Sure, I've heard of some of the studies, such as the ones related to the huge probability of obesity and depression and cancer rates for people who don't get 8 hours of sleep, but when we see all the other facts involved with it are all laid out, I frankly despair. Our societies are made up of complete idiots. Most of the most powerful and necessary REM sleep happens in the last block of sleep, between 6-8 hours. Most of us are reducing our sleep to 6 or less. Learning and retention and memory decrease as if you're constantly drunk, and the long-term effects short circuit all rational behaviors. We eat more because we act high. We get into more car accidents. Test performance is abysmal, as is our moods, our ability to digest foods properly, and our ability to resist the flu drops from an 18% chance at 8 hours of sleep to a whopping 50% chance when you get less than 6 hours. These are studies, based on people who, in a controlled environment, are swabbed with the sick. Think about that. Add VERY significant numbers to cancer, suicide, and total life dissatisfaction, and the picture becomes very dire. Oh, and sleeping pills short-circuit the REM cycle. As do drugs for ADHD. This is the funniest and most horrible thing I picked up here: Teens all have a natural change in their circadian rhythm. They all become night owls. So WTF are we forcing them to get up earlier and earlier to go to school? They AREN'T getting enough sleep. So what happens? They go in, do abysmally in school, show all the same symptoms as ADHD, get diagnosed with ADHD, and then get drugs to help them concentrate while only making the fundamental problem of not getting enough REM sleep WORSE. And I'm talking about ALL of us. Long term sleep deprivation is the thing we do to TORTURE PEOPLE WE DON'T LIKE. And yet, there's this thing about rewarding long work cycles, turning people in unthinking zombies with decreasing work productivity JUST BECAUSE we're trying to squeeze out that last hour of work? It's KILLING US. Literally. Our minds aren't working well enough to even realize there's a problem. Put a STOP to this! Seriously, folks! This is right up there with dancing around in a cloud of radium. Oh, look, it's so pretty! Hands down, one of the best books I read this year (more like ever, to be honest). So, a miracle drug has been discovered. A revolutionary new treatment that makes you live longer. It enhances your memory, makes you more attractive. It keeps you slim and lowers food cravings. It protects you from cancer and dementia. It wards off colds and flu. It lowers your risk of heart attacks and stroke, not to mention diabetes. You’ll even feel happier, less depressed, and less anxious. Sleep! Who would ha Hands down, one of the best books I read this year (more like ever, to be honest). So, a miracle drug has been discovered. A revolutionary new treatment that makes you live longer. It enhances your memory, makes you more attractive. It keeps you slim and lowers food cravings. It protects you from cancer and dementia. It wards off colds and flu. It lowers your risk of heart attacks and stroke, not to mention diabetes. You’ll even feel happier, less depressed, and less anxious. Sleep! Who would have imagined?! And on the other hand, failing to get this drug will result in extensive damage to your overall health, and no aspect of your biology would be left unscathed. Sleep deprivation! Many of us are bizarrely convinced that getting by with constantly less hours of sleep is actually a sign of coolness and exceptional abilities to function as a super-human. Due to this utter ignorance about the importance and the complexity of sleep’s role in our lives, we do a great disservice to ourselves and mostly to our children, who grow up with the notion that getting enough sleep could be labeled as laziness. Instead, we should realize that our sleeping hours are not an endless resource from which we can borrow limitless amounts of time "to do productive work", as I personally very often do (I really wished to be able to say "did", but alas, I've only managed to lightly reduce this vice). They are not. And the work of a sleep deprived person isn't as productive as one'd imagine. Eventually the constant low level exhaustion becomes our accepted norm. We fail to recognize how our habitual state of sleep deficiency has come to compromise our mental aptitude and physical vitality, resulting in the slow accumulation of ill health. Matthew Walker is a sleep scientist and does an e Sleep has been a big mystery for long, as it has been unclear what purpose it serves, and why natural selection did not weed it out. After all, in earlier times, the period of sleep must have been one of considerable danger for humans (and even now for many animals and birds). And yet, sleep is a common requirement across the animal kingdom as well. In fact, birds and some sea creatures have the remarkable ability to sleep half a brain at a time. There's an overwhelmingly positive experience I had with this book. For most of it, Walker talks about his research (and his colleagues) surrounding the sleep and those arguments are fascinating and convincing. However, there are moments, mostly closer to the end of it, when you feel like you are listening to a sales pitch. First of all, I dislike when somebody uses percentage without reference, ie "it's a 150% growth" as it might easily mean it was 1% in the past and now is 2,5% (150% growth), There's an overwhelmingly positive experience I had with this book. 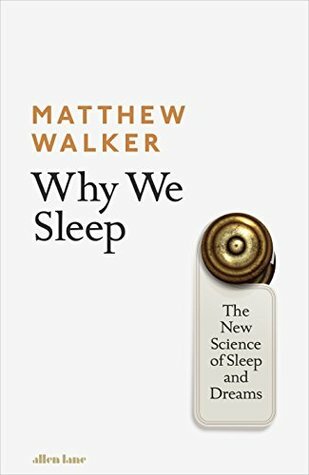 For most of it, Walker talks about his research (and his colleagues) surrounding the sleep and those arguments are fascinating and convincing. However, there are moments, mostly closer to the end of it, when you feel like you are listening to a sales pitch. First of all, I dislike when somebody uses percentage without reference, ie "it's a 150% growth" as it might easily mean it was 1% in the past and now is 2,5% (150% growth), which in some situation might be significant in others not at all. Second, the seek for real-life examples of dangers of the lack of sleep was on the border of simplification, as even though I didn't research it I'm pretty sure (due to the simple application of logic) that most outcomes are caused by a conglomerate of factors. When he talked about a drop in teenage accidents when school hours were moved one hour later, I couldn't stop thinking, that maybe it's not all necessary due to the fact that they drive better being well rested. For sure that's a factor but maybe if school started at 9, the hour most of the office jobs start, maybe some parents would drive the kids to school. This is just an example but that was bugging me. When he mentions in passing Chernobyl disaster and blames it on lack of sleep, I was thinking it's such a shame that he sells himself so short, as this book is a great scientific study of sleep while this argument is just bananas. Sure tiredness played some role but the disaster was mostly caused by inherent design flaws and violation of safety measures. We often hear that sleep, diet and exercise are the three pillars of health, but Walker, a professor of neuroscience at the University of California, Berkeley, goes further: he believes sleep is the platform on which diet and exercise rest. Getting 7–9 hours of sleep a night is not some luxury to aim for but an absolute essential for the brain to process new information and prepare for receiving more the next day. Dreaming is like overnight therapy, and fuels creativity. Sleep deprivation has be We often hear that sleep, diet and exercise are the three pillars of health, but Walker, a professor of neuroscience at the University of California, Berkeley, goes further: he believes sleep is the platform on which diet and exercise rest. Getting 7–9 hours of sleep a night is not some luxury to aim for but an absolute essential for the brain to process new information and prepare for receiving more the next day. Dreaming is like overnight therapy, and fuels creativity. Sleep deprivation has been associated with dementia and cancer: it’s no accident that Margaret Thatcher and Ronald Reagan, who prided themselves on getting by on just five hours of sleep a night, both developed Alzheimer’s. Just a few nights of insufficient sleep can weaken the immune system and increase the risks of developing a serious illness. It’s no wonder Walker calls sleep loss an epidemic. It’s a fairly long and dense book, with smallish type and scientific figures, so I knew I was unlikely to read the whole thing, but enjoyed mining it for fascinating information about evolution, neuroscience and child development. I am obsessed with learning about sleep, and sleep hygiene. I will read article after article on the topic, even if it's just regurgitating the same old stuff. It just feels calming to me. Despite that though, I'm quite bad at practicing what I preach (to my husband and anyone else who will listen). This book is anything but calming however. In fact, it will put the fear of god into you. It is however the most informative text I have ever read on the topic of sleep and dreams, and I believe it wi I am obsessed with learning about sleep, and sleep hygiene. I will read article after article on the topic, even if it's just regurgitating the same old stuff. It just feels calming to me. Despite that though, I'm quite bad at practicing what I preach (to my husband and anyone else who will listen). This book is anything but calming however. In fact, it will put the fear of god into you. It is however the most informative text I have ever read on the topic of sleep and dreams, and I believe it will have a genuine effect on how I go about prioritising sleep from now on. It can be a touch dry at times, particularly in the first few chapters, but it is at the same time utterly fascinating. The amount of facts I have regurgitated to family and friends while reading this book is ridiculous. I drank up the knowledge this book gave me, the crazy research experiments, the humour that Matthew Walker exhibits. And often I gave into sleep after reading only a few pages at a time - not because I was bored mind you, but because the author gave me permission to. And that is amazing, and something I should give into more often in the future. This was good! It contains a lot of scientific information about sleep and dreams. Should you feel drowsy and fall asleep while reading the book, unlike most authors, I will not be disheartened. Indeed, based on the topic and content of this book, I am actively going to encourage you that kind of behaviour from you. Finally, the book whose author actually said that he will be happy if a reader fell asleep while reading it. Great book! I have to admit, I skipped a few chapters due to my incompetence in sleep science. But I am still rating it 5* stars since it was a great and interesting read. In my opinion M.P.Walker said everything about sleep that could be said. The thing I liked the most was the style - it had a flowing continuity that was easy to understand for an average reader (I like stuff called popul Finally, the book whose author actually said that he will be happy if a reader fell asleep while reading it. Great book! M.P.Walker manages to address even the oddest facts of sleep with fun and yet scientific attitude. The examples he chooses are relevant and relatable, author know how to make a point without preaching. You will get a tons of arguments to explain people why you are an owl, why school should start later, why you shouldn't take sleeping pills, and damn, why we sleep. There was nothing really new here but I really liked how the author showed the importance of sleep! so yay to taking naps without feeling guilty! I love sleep, and I constantly find myself drawn to books on the topic. Not only was Why We Sleep was a thorough exploration of sleep and its many aspects, full of scientific fact, theory, and study, but it was also highly engaging. The audiobook narration was also spot on, making for an unputdownable reading experience. Highly recommended. This is going to sound naive but it still surprises me that so many scientists can be so vain. I like to imagine them outside and above such concerns but of course they arent: theyre as human as the rest of us. They want to win prizes, "go down in history", have students applaud them in lectures and be popular. Walker is Professor of Neuroscience and Psychology at the University of California, Berkeley and tours, lectures and writes on sleep and sleep science. This book - which can be read in or This is going to sound naive but it still surprises me that so many scientists can be so vain. I like to imagine them outside and above such concerns but of course they aren´t: they´re as human as the rest of us. They want to win prizes, "go down in history", have students applaud them in lectures and be popular. Walker is Professor of Neuroscience and Psychology at the University of California, Berkeley and tours, lectures and writes on sleep and sleep science. This book - which can be read in or out of order - covers all the topics you would expect (Why We Sleep, Why We Dream, etc) and if there is a message it is that modern life and modern technology (not to mention pills, booze and other drugs) are affecting our natural sleep patterns and having grave societal consequences. The problem for me with the book is the style. This book is popular science by numbers and, while informative and, in a few cases, enlightening, it is on the whole exactly what every other popular science book is like. There are the "let me make this simple for you" analogies. There are the descriptions of experiments included as evidence as "ingenious", "clever", "fascinating". There is the slightly over-baked flagwaving on behalf of a subject - in this case - "sleep" which sometimes tips over into ridiculousness (Walker says at one point that life´s natural state is sleep, not wakefulness, although he almost immediately takes it back). I don´t know. Maybe I just took it wrong. Maybe I just don´t sleep enough (my neighbours woke me this morning banging about at 6am) and as I write that I can almost hear Walker humming and rubbing his hand through his fringe and saying, "ya see? ya see?" If you've ever slept you should read this book. I always thought that sleep was a waste of time which drains away about a third of our life. So why bother with it? Why would I not sleep as little as possible and spend my waking time doing things I like? Well, it seems that there are a throng of reasons why we shouldn't do this, all of them drawn from scientific research. Yep, that's what sleep does and guess what: you're probably doing it wrong. The tricky part is that both quantity and quality matter. The book guides you on the journey to sleep better and improve your quality of life tremendously. My favourite book of 2018 so far and one of my all time non-fiction favourites. So much in there that just makes sense and explains a lot - wish that I had read this 30 years ago when I started my working life but without giving too much away I shall be making sure that I get my 7 to 8 hours sleep every night (if I do have to work late, I'll make sure that I don't have an early start the next day) , refrain from alcohol just before sleep, avoid looking at my phone in the evening (blue light which My favourite book of 2018 so far and one of my all time non-fiction favourites. So much in there that just makes sense and explains a lot - wish that I had read this 30 years ago when I started my working life but without giving too much away I shall be making sure that I get my 7 to 8 hours sleep every night (if I do have to work late, I'll make sure that I don't have an early start the next day) , refrain from alcohol just before sleep, avoid looking at my phone in the evening (blue light which makes your brain think it's daytime), never drive when feeling tired, take exercise at least 2 hours before bed. I don't drink coffee late in the day (or at all) or take sleeping pills but if you do then you need to stop ! This is the must read of must reads - everyone needs to read it to take advantage of the best medicine around - sleep. I dalje stoji da ovo može da se posmatra i kao popscience knjižica, ali i kao klasični žanrovski horor. Bokte, ne sećam se da me je išta ovoliko trglo u tolikoj meri da legitimno promenim neke navike (a sigurno nisu danas pijačno popularne šećer/ugljenihidrati histerije; samo što nisu i na pijaci počeli da prodaju tzv organske namirnice). Voker argumentovano i istraživanjima podupreto prolazi kroz sijaset tema u vezi sa snom i spavanjem: da li su san i spavanje važni za nas ljude (hint: važni su I dalje stoji da ovo može da se posmatra i kao popscience knjižica, ali i kao klasični žanrovski horor. Bokte, ne sećam se da me je išta ovoliko trglo u tolikoj meri da legitimno promenim neke navike (a sigurno nisu danas pijačno popularne šećer/ugljenihidrati histerije; samo što nisu i na pijaci počeli da prodaju tzv organske namirnice). Voker argumentovano i istraživanjima podupreto prolazi kroz sijaset tema u vezi sa snom i spavanjem: da li su san i spavanje važni za nas ljude (hint: važni su), šta nam radi njegov nedostatak (svašta) i zašto je tačno društvo toliko slepo kada je reč o nečemu toliko očigednom kao što je (nedostatak) san? Dotiče i normativnu kletvu društva, organizovanog rada i školstva, daje neke (ekstremno optimistične) predloge za DIY postizanje promene na lokalnim i globalnim skalama, i soli sa dovoljno zanimljivih anegdota da ovo dosta lagano teče. Malo se previše ponavlja na trenutke (česta mana popnauke), ali ni to nije strašno. Vitalno štivo, u skoro pa svakom smislu. Some are getting too much, most aren't getting enough. No, I don't mean that; what I am talking about is sleep. There are people out there who seem to be able to exist on almost no sleep, people who are in the office at stupid o'clock in the morning and who are still up way after midnight. While scientists knew that we needed food and water and could explain why, no one could adequately explain why we slept, what purpose it served. It is only recently though that scientists have been able to und Some are getting too much, most aren't getting enough. No, I don't mean that; what I am talking about is sleep. There are people out there who seem to be able to exist on almost no sleep, people who are in the office at stupid o'clock in the morning and who are still up way after midnight. While scientists knew that we needed food and water and could explain why, no one could adequately explain why we slept, what purpose it served. It is only recently though that scientists have been able to understand through decades of cutting-edge research just how key sleep is to our health and well-being. In essence, sleep is an essential element to our well being and health and in this book, Professor Matthew Walker sets out just how important it is and how most common diseases in the modern western world have roots deep within our lack of sleep. In this he will explain just what the different sleep types are and how they help us think over deeper and long-term issues, the effects of stimulants on our sleep and why do most teenagers drive like they are missing part of their brain? Because they are… It takes deep sleep and developmental time to accomplish the neural maturation that plugs this brain 'gap' in the frontal lobe. There is a fascinating demonstration on how lack of sleep can affect how we perform; he shows that sleep deprivation can have an equivalent effect to alcohol when driving. Wordy but good content. I'm making sleep a bigger priority. I was once fond of saying , “ Sleep is the third pillar of good health , alongside diet and exercise . ” I have changed my tune . Sleep is more than a pillar ; it is the foundation on which the other two health bastions sit . Take away the bedrock of sleep , or weaken it just a little , and careful eating or physical exercise become less than effective , as we shall see . sleep tips from his Fresh Air (10/16/2017) podcast appearanc Wordy but good content. I'm making sleep a bigger priority. 1. Stick to a sleep schedule (start and end time). 3. Avoid nicotine and caffeine (8 hrs before). 7. Don’t take naps after 3 p.m.
10. Dark bedroom, cool bedroom, gadget-free bedroom. Caffeine is not a food supplement. Rather, caffeine is the most widely used (and abused) psychoactive stimulant in the world. It is the second most traded commodity on the planet, after oil. The consumption of caffeine represents one of the longest and largest unsupervised drug studies ever conducted on the human race, perhaps rivaled only by alcohol, and it continues to this day. Did you get eight hours of sleep tonight? Ironically, I started reading this on a night I had trouble falling asleep and it took me about a page to feel scared for life. I am not joking when I'm saying that his book is more alarming than some of those gory post-apocalyptic horror novels out there. Just an hour of sleep deprivation is considered to have significant impact on our health. We become less effective, less productive, less friendly and attractive even and more vulnerable to a variety of Did you get eight hours of sleep tonight? Ironically, I started reading this on a night I had trouble falling asleep and it took me about a page to feel scared for life. I am not joking when I'm saying that his book is more alarming than some of those gory post-apocalyptic horror novels out there. Just an hour of sleep deprivation is considered to have significant impact on our health. We become less effective, less productive, less friendly and attractive even and more vulnerable to a variety of diseases and medical conditions. "The shorter your sleep, the shorter your life. The leading causes of disease and death in developed nations—diseases that are crippling health-care systems, such as heart disease, obesity, dementia, diabetes, and cancer—all have recognized causal links to a lack of sleep." If you are now thinking "Who the hell has time for eighth hours of sleep a night?" then you're addressing one of the problems Walker is, too: Our society is constructed in a way that is contra-productive to our biological built. Our children have to be in school at 8 o'clock, we ourselves have to be at work at 9 and don't forget that birthday party this Saturday from which you won't come home until 5 in the morning. What's even worse is that many of us don't even realize that they're not getting enough sleep. We consider the need for coffee and fatigued stay-in-bed-Sundays normal, simply because of daily routines that are forced upon us don't allow us to experience what it's like to actually be rested. Who knew that sleep is the “fountain of youth” yet is one of the most neglected remedies serving to safeguard us from cancer and protecting us from getting in a car crash. Matthew Walker runs a sleep lab at Berkeley and for the last 20 years has studied the "pouvoir réparateur" sleep imparts. Walker contends more sleep results in fewer mental health issues/suicides. Surprisingly, lack of sleep is linked to decrease in life expectancy. “...across the cardiac, medical and surgical ICU units, studi Who knew that sleep is the “fountain of youth” yet is one of the most neglected remedies serving to safeguard us from cancer and protecting us from getting in a car crash. Matthew Walker runs a sleep lab at Berkeley and for the last 20 years has studied the "pouvoir réparateur" sleep imparts. Walker contends more sleep results in fewer mental health issues/suicides. Surprisingly, lack of sleep is linked to decrease in life expectancy. Disturbing the circadian rhythm or boxing with mother nature is never a match you can hope to win. Lack of sleep kills e.g. your surgeon has had only 6 hours of sleep resulting in a 170% increase in a surgical-errors. Personally, I am guilty of sleep deprivation (fall time change) finding myself “exhausted” well past espresso/caffeine infusion and clocked in for "hours of sleep." I heard Walker on NPR and was promptly brought to hysterics over the danger of sleeping too little. I had a techy friend block the wifi on my home router from 8pm until morning, then I bought a data disabling add-on from my phone carrier for my cell phone to lock that too, and I began to measure my smartwatch sleep metrics like workout results; look at me, nine hours! I also procured the book and fell asleep to it quite a few times, which might be a twisted compliment to the author. The other da I heard Walker on NPR and was promptly brought to hysterics over the danger of sleeping too little. I had a techy friend block the wifi on my home router from 8pm until morning, then I bought a data disabling add-on from my phone carrier for my cell phone to lock that too, and I began to measure my smartwatch sleep metrics like workout results; look at me, nine hours! I also procured the book and fell asleep to it quite a few times, which might be a twisted compliment to the author. The other day at dinner with a friend, while discussing this book, he said "isn't it amazing that for all the science we have, we don't actually know why we sleep?" I, the newfound Sleep Police, said we do know, since the book I was reading was actually titled "Why We Sleep". And then I began to fumble. I realized that for all the interesting bits of insight into sleep science that can be found in this book, I didn't walk away with a logical, concrete answer to why we sleep; I finished the book and still don't know what mental processing occurs in our sleep that could not have been accomplished otherwise; what really happens when we dream, the neuroscience and evolutionary explanation of the brain blacking out for hours on end.